Zaire & Science: EWWWWW!!!! Whats that next to my bag?!?! EWWWWW!!!! Whats that next to my bag?!?! So I found out that this creature is called the House Centipede. Disgusted out of my mind, I searched a couple of sites looking for the fuzzy multi-legged visitor. It's scientific name is Scutigera coleoptrata. Its identifying colors are yellow, black and white. It size is approximately 34 to 35mm. They have 15 pairs of legs and males usually have longer antennae in the back. I found out that they are attracted to damp moist areas, porches, and may sometimes arrive in a bathtub drain (I thought the last one was kind of rude). As someone who is afraid of insects (or anything else that crawls or slithers) I was not happy to see this creature lurking in my hallway. However, I did find out something rather interesting about them. 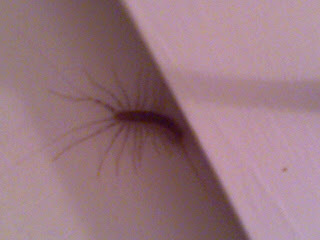 Centipedes often keep away other nasty pests such as cockroaches, and moths away. Perhaps these visitors may be helpful after all, still, I would not appreciate the peaking creature while in the tub!